Mountain unicycling, or muni, takes place on off-road terrain. Muni riders move fast, like mountain bikers, on unpredictable and aggressive ground. Mountain unicycles are built to take all the abuse of a severe mountain trail. Unicycle hockey is hockey played on unicycles in teams of five. It is a fast-paced game of strategy and skill, and it is great for improving your unicycle handling skills. 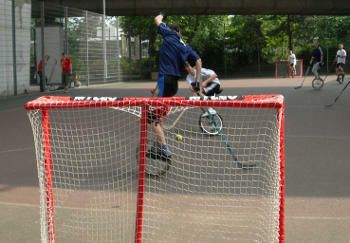 The UK Unicycle Hockey League provides up to date information upcoming tournaments, results and league tables. Street unicycling is a type of unicycling that focuses on performing tricks on urban obstacles (e.g. curbs, ledges, stairs and hand rails). 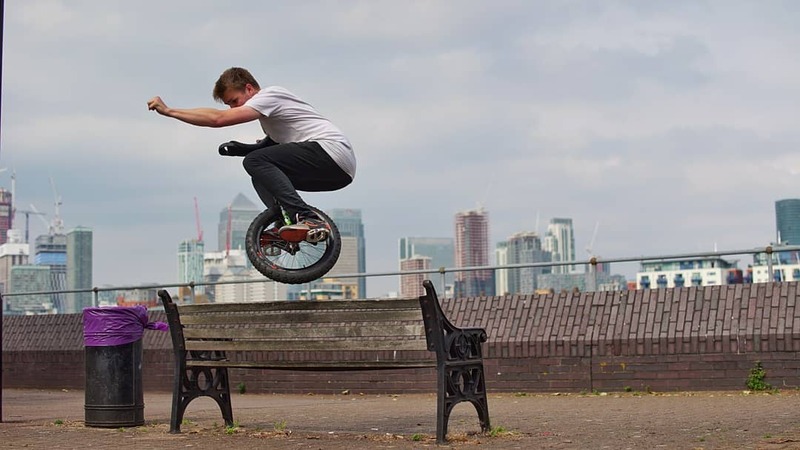 More information about street tricks can be found in the Unicyclopedia. Flatland unicycling involves riders performing tricks without obstacles, such as jumps, wheel flips, and spins, without touching the ground. The art of negotiating a course of obstacles on a unicycle is called trials unicycling. Trials unicyclists use small, strongly built unicycles with knobby tyres, making big jumps, narrow squeezes, and precarious traverses along tight beams and rails. Road unicycling is about getting somewhere fast. Distances range from short sprints to long tours of hundreds of kilometers, and many people use it as a form of transport. Road unicycling is a fantastic way to see the world. These unicycles look different from other unicycles. Road unicycles have a larger wheel size to enable faster speeds. A handle may allow the rider a diversity of riding positions and can support bags or other equipment.